The Shirofugen Cherry tree is the last cherry to bloom and is a beauty to behold. 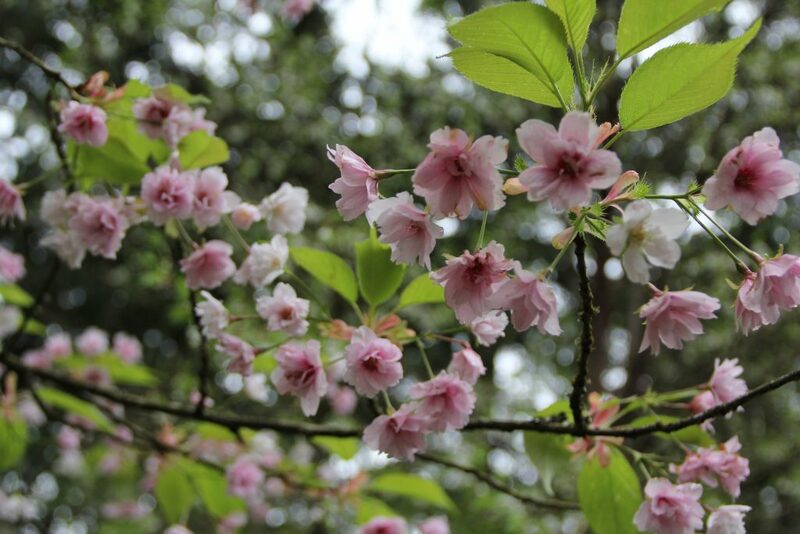 Shogetsu Cherry trees have double white blossoms that emerge in April and May. Also among the cherries are some gorgeous Dogwoods, Redbuds, and a Judas tree. Find them along the connector trail between the Wildwood and Hawthorn Trails. The Kousa Dogwoods – ‘Nana’, ‘Moonbeam’, and ‘National’ – are looking spectacular right now! They create a sea of white flowers, though what you see are the sepals and not the flower petals, which are actually small and clustered in the center of the sepals. Look for them around the Vietnam Veterans Memorial. Take in our later-showing magnolias, blooming white, pink, and red within a canopy of large, tropical-looking leaves. Also see the rare Magnolia ashei, Magnolia wilsonii and Magnolia ernestii — all on the International Union for the Conservation of Nature’s (IUCN) Red List of Threatened Species.